… another year, that is. 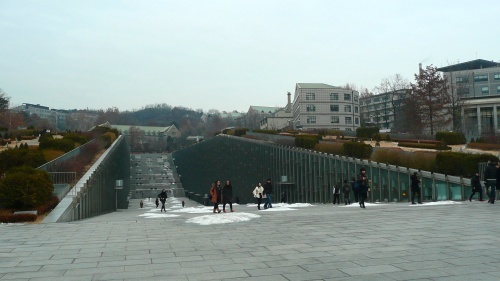 Having met Mary the day before, we’d made plans and I duly went to meet her at Ewha Women’s University, where she’s a student. 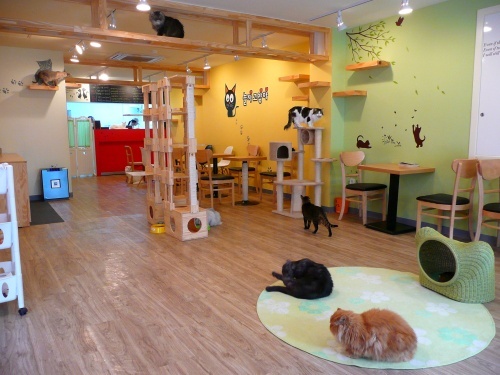 We went to a cat café – the first time I’d been to one, which is pretty astonishing, given how much I love cats. We were the only customers there until four schoolgirls came in later. There were about fifteen cats in the moderately sized café, perhaps more, of lots of breeds – longhairs with and without squishy faces, some tabbies, including something like an ocicat, and a calm, assertive pair of Siamese or similar cats that sat on our table and let us adore them. I’m not really up on cat breeds, so I can only guess at their types. The place looked very clean, but was a little smelly. The cats were mostly friendly and inquisitive, but some of them evidently didn’t like some of their fellow inmates. We got coffees for ourselves and a tiny cup of treats for the cats and mused on the kind of life the cats must have and must’ve had in the past. Afterwards, Mary took me a museum on the nearby campus that contained lots of hanbok – traditional clothing – and furniture. We walked down the trench that is the main architectural feature of the university – as a building, it’s appropriately uterine rather than phallic – and had a look, and lunch, inside. For much of the day, we’d been expecting Matthew to join us, but he turned out to be excessively busy with work. We even went to see a film (One Day; annoyingly will-they-won’t-they-ish at first, but it grew on me somewhat; Anne Hathaway was especially lovely as the freckly, bespectacled, northern British protagonist) to wait for him. He turned up as we were having dinner and we had drinks together afterwards. The following day, I played Magic and a new (to me) game called Zombies!!! with Eric. I’ve not hung out with him that much, but he’s a very nice chap and it was good to chat with him. 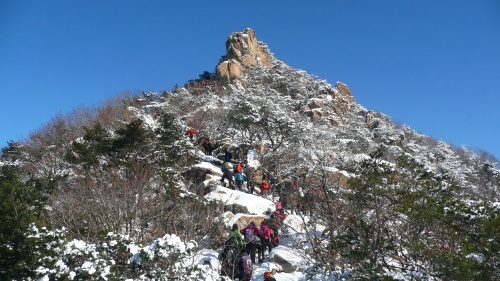 The next day, I went on a hike near Anyang – for which I’d especially bought crampons the day before from one of a series of outdoors gear shops I’d seen lots of times when I lived in Cheongdam. The crampons worked extremely well; having slipped and slid on packed snow the last time I’d gone for a hike, the grip provided made me feel especially stable. The hike was organised by a couple of groups: Indigo Hill and the unfortunately named SHITY – Sunday Hikers Interested in Trekking Yet-again. It lasted over five hours and the weather was very cold and very sunny. The snow wasn’t very thick on the ground, but thick enough to beatify the landscape in that way that only snow can; it clung to the limbs of pine trees in lumpy lines. Afterwards, we went for a meal of chicken stew with lots of side dishes. The leaders of the group were very friendly – as, indeed, were all the hikers. There was an American guy who could apparently teach you anything – scuba diving, skiing, salsa dancing (but this latter only if you were of the opposite gender). I exchanged numbers with a few people. Later, a smaller group of us went to a singing room or noraebang in the nearby city, where I gave a rather unsteady rendition of ‘The Day That Never Comes’ by Metallica (and rather better performances of ‘We Will Rock You’ and ‘Strange Kind of Woman’). A cute hiker with not much English and the unusual name of Ok (pronounced something like ‘oak’) dragged me to my feet to dance. The next day, New Year’s Eve, I met one of the hikers I exchanged details with the previous day for coffee. After meeting her, I headed straight over to Gangnam for the first stage of the New Year’s Eve event I’d signed up for on Meetup.com. This consisted of dinner at one of the chains of western-ish-style buffet restaurants that are popular in Korea – Ashley’s. The food was mediocre at best, but there was a limitless supply of four wines (which I mostly liked, so they were probably crap, too). I said hello to various people and exchanged introductions, sat with three American girls for dinner and we were joined by a Korean and a South African couple. Afterwards, we had to take the subway across the city to Hongdae for the other part of the package – Club Mansion. There’s really nothing mansion-like about this place, but it’s one of the more exclusive places, apparently costing ₩20,000 to get in. I danced with a couple of women that I liked; had a brief and fairly innocent romantic moment with one, but, alas, I don’t think anything will develop between me and any of the three women I met that day. I did quite get into the dancing – which is surprising. Shocking, even. The very idea of dancing usually fills me with a vague sense of humiliation. But with five glasses of wine and a few beers in my belly as well as no one around that I knew (and therefore no expectations on me to behave in the way that I expect them to expect me to behave), I was able to enjoy the time in the way that one is supposed to enjoy it. Mary also turned up at the club (which is how I know how much it cost), but we didn’t spend much time together. Later, I hung out at the Hongdae Tom N Toms, waiting for the subway to open, with a young guy I’d met in the group of people I’d tagged along with. He fell asleep as we sat at a table and I was deeply engrossed in my smart phone – and pretty sleepy myself. When I woke him up to leave, he didn’t have his phone – the upshot being that it had almost certainly been stolen. Someone might almost literally have snatched it from under my nose as it sat on the table. The fact that my own phone may have been taken from someone in similar circumstances made me feel extra crappy – although not nearly as crappy as my New Year’s acquaintance. That morning, I got back to Zach’s place at maybe seven o’clock. I woke up at 10:30 and decided not to try to sleep more. Matthew and I played Magic later in the day and I headed back to Cheonan in the evening. The following day, I met three people at an Indian restaurant near Cheonan Station for dinner. The food was great – I had a buttery chicken curry (can’t remember exactly what kind) – and the three women (Americans) were nice and friendly (as, too, was the chatty guy (American) who didn’t join us, but hung around for a while after he’d finished his own, separate meal). They’d all travelled varying distances for the meal – which someone had suggested on a Facebook group – and, with my hours of 2:00 to 9:30 and my determination to do lots of social stuff in Seoul and Daegu at weekends, I’m unlikely to see them again soon. At some point in the day or two after the, dare I say, euphoria of New Year’s Eve, I had a kind of emotional crash. A small one. I don’t often spontaneously cry – by which I mean, not without reason, but without a trigger – but this was one of those times. I was feeling lonely and pitiful and kind of stupid. To some degree, I became someone else on New Year’s Eve and I was expecting him to be more successful at flirtation and romance than I’ve ever been. Naïve of me to think that kind of thing is ever easy. Still, the year is yet young, and, in just a few days from now, I will have money to spare for trips and events and suchlike and we will see what happens.